The image that most often comes to mind when we think of electric interurban railways is one of large brightly painted trolley cars filled with travelers, plying the rails between small rural towns and bustling big cities. These cars were more than just a source of weekend diversion for adventurous city dwellers. For many small communities, they provided a reliable connection to the outside world, allowing access to new markets for locally produced goods and bringing newspapers, mail and packages from far away locales. To provide for the diverse needs of its patrons, the Cleveland & Eastern, like most interurban lines, required a variety of equipment to accommodate both its passenger and freight needs. In addition, the line also used specialized pieces of equipment to keep its overhead electrical system working and tracks in good condition. These operations also included keeping the powerhouse supplied with coal and the line clear of snow and ice in Geauga County's harsh winters. The most common type of interurban car was the parlor car, or coach, which was made to carry passengers and frequently contained a separate smoking section for gentleman travelers. Others cars, known as combines, had a freight compartment for mail and small packages along with the standard parlor section. The latter cars are recognizable by the larger freight doors near the motorman's compartment at one end. Some cars were equipped with a motorman's compartment at only one end. These cars required either a loop or "wye" at the end of the line to turn the car around for the return trip. Other cars were equipped with motorman's controls and trolley poles at both ends, and were needed for situations where no facilities were available to turn the cars. The first Cleveland & Eastern interurban cars arrived in late 1899 or early 1900. These cars were named for places along the route such as Chardon, Burton, Mayfield, Munson, and Gates Mills. Some were also named for Geauga County locations the line would never reach such as Hambden and Parkman. The first set of six coaches came from the Jewett Car Company of Jewett Ohio, which also supplied two combines. An additional three cars came from the St. Louis Car Company of St. Louis Missouri. After the fire, the line found itself in great need of new equipment. In 1901 ten new cars were purchased from the St. Louis Car Company. These cars were not named, instead they were numbered #15 through #24. All were built as single end coaches. Cars #15, #22, and #23 were later rebuilt as double ended cars and Car #15 was later rebuilt yet again as a combine, possibly after one of the line's numerous collisions. Cars #16 and #19 were also used for a time on the Cleveland & Chagrin Falls interurban line, another part of the traction empire controlled by the Everett & Moore Syndicate. The full account can be found on our Historical Newspaper Stories page. Two cars were purchased from the Niles Car Company of Niles, Ohio to replace the wrecked St. Louis cars. The Niles cars, also numbered #18 and #21, along with St Louis cars #22, #23, and #24 were all in inventory at abandoment in March of 1926. While the disposition of cars #16, #19, and #20 is unknown, #21 was sold to the Niagara, St. Catharine's & Toronto Railroad. It is likely that it had been stripped of its motors and control equipment prior to the sale as it was used by the line as a trailer. By 1903, patronage of the line had increased and the Cleveland & Eastern found that the fleet of St. Louis cars needed to be augmented to meet the growing demands of the local populace. A deal was made with the Kuhlman Car Company of Cleveland, Ohio, and the line took delivery of eight new coaches. The cars were numbered #36 through #39 and #51 through #54. The Kuhlman cars featured tile floors and wider windows than those generally used on interurban cars of the period and were known as "picture window" cars. The gap in the number sequence occured because numbers #40 through #50 were used for work equipment and freight motors. The Kuhlman cars were also of the single end design favored by the line, but Car #38 was later rebuilt for double ended operation. The picture window cars were a favorite of the many city dwellers attracted by the scenic beauty that Geauga County continues to offer today. These cars became the mainstay of daily operations, and most ran faithfully for more than twenty years. After abandonment, the body of Car #53 was used as a diner on Lee Road in Cleveland and the parlor section of Car #54 was still in use as part of a Chinese restaurant in Wooster, Ohio, into the 1970's. It is a sad footnote that several of these beautiful cars, along with some of the older stock still on the property at the end, were stripped of their running gear and burned behind the line's car shops in Gates Mills. The line would only purchase two additional passenger cars after the pair of Niles coaches acquired in 1907, both in 1915. Car #56 came from Kuhlman and Car #57 was purchased from Niles. Both were single ended cars of all steel construction and had rounded roofs like the new streamlined passenger cars favored by the steam railroads. The cars were only ten years old at abandonment. Like Niles Car #21, both were sold to the Niagara, St. Catharine's & Toronto Railroad, where they continued to operate for many years. Car #56 was taken out of service and scrapped in 1959, while Car #57 was taken out of service in 1945. The latter is rumored to have been taken to a remote farm somewhere in Ontario, but its whereabouts and disposition remain a mystery. 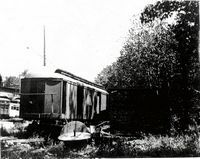 The second common type of interurban cars were designed for freight service and had large doors on the sides for loading goods to be delivered along the line. These were appropriately called 'freight motors' and sometimes refered to only as motors. The freight motors, larger and more powerful than the coaches, were often equipped with railroad style couplers and used for moving steam railroad freight cars. Other freight motors were used only in mail service and had interiors like those of the railway post office cars seen on the steam railroads. The freight motors of the Cleveland & Eastern saw a variety of uses, hauling everything from packages and machinery to cans of milk and maple syrup. Several of the heavier freight motors were also used to convey box cars to customers like the Burton Handle Company as well as coal cars to the line's Gates Mills power plant. Other businesses along the line included a logging operation near Fullertown and a gravel quarry at Scotland, which both provided building materials to meet the needs of the growing city of Cleveland to the west. The busy freight motors also provided customers direct service to the line's depot at the Electric Package Agency complex, located on Eagle Avenue in Cleveland. Here, many of northeast Ohio's interurban lines and delivery services converged to exchange cargo. The Cleveland & Eastern had several freight motors. Most were numbered, although there was also a motor named Geauga. It is likely that this motor was built from the original coach of the same name when it was retired from passenger service, a practice common on many roads at that time. The few existing photographs of the car show that it similar in size and appearance to the early parlor cars of the line. The numbered motors start with #40 as the line seems to have reserved numbers in the #40 to #50 range for freight and maintenance equipment. Motor #40 was built by the St. Louis Car Company. It was most likely ordered along with the set of coaches recieved in 1901. Motor #40 was still on the property at abandonment. Little is known about Motors #43 and #45. Motor #43 was eliminated from the roster early on, but Motor #45 was known to have been used on the Chagrin Falls line for several years. Motor #50, which came from Kuhlman in 1904, was probably ordered around the same time as the two sets of Kuhlman coaches delivered in 1903. This motor was also on the property at the end. Motor #55 was built by Niles, possibly purchased in 1907 when the line ordered two coaches from the company to replace those destroyed in a wreck in February of that year. After abandonment, Motor #55 went to Canada with cars #21, #56 and #57. Motor #60 was the last piece of new equipment the line would purchase. It disappeared from the roster in 1918, possibly to raise much needed cash as bankruptcy loomed yet again. Like other railroads, the Cleveland & Eastern had several pieces of equipment that were used in the maintenance of the line. The number #41 was assigned to a Brill built snow scraper acquired in 1901. Number #42 was a Russell line car also purchased that year. It was built much like a freight motor, with the addition of a large platform on its roof that allowed workmen access to the overhead wires used to supply the cars with electricity. Both cars went to the Niagara, St. Catharine's & Toronto Railroad when operations ended. Number #46 was an electric locomotive in the line's shops, possibly from a wrecked car. The locomotive was used for line maintenance along with a railroad flat car numbered #14. In the early years, it was also used to haul coal cars to the powerhouse in Gates Mills from the line's interchange conections with the steam railroads. This service was discontinued in 1913 when the power house was shuttered and line began purchasing electricity from the Cleveland Electric Illuminating Company. Another small but essential piece of equipment was the line's four-wheeled welding car which it used for rail bonding, a process that assured the electrical conductivity of the track and completed the circuit from the overhead lines through the car's motors and back to the power house. DC current to power the welding unit was drawn from the overhead line. It was among the items offered for sale after abandonment, but it's disposition is unknown. The line had also purchased two steam locomotives which were used in construction. Number #107 was of the 2-6-0 configuration and was built by the Baldwin Locomotive Company in 1892. It was acquired second hand from the New York, Chicago and St. Louis Railroad. In addition to the construction work, it was used to haul a passenger car borrowed from the Lakeshore & Michigan Southern Railroad for the line's first revenue operations. The second locomotive was of the 4-4-0 configuration may have come from the latter road, but its number is unknown. Both were destroyed in the car barn fire of 1900. Although the electric railways played a vital role in the lives of the people of Geauga County in the first quarter of the 20th century, the cars and rails are now little more than a memory. Of the Cleveland & Eastern cars, the parlor section of one of the Kuhlman picture window cars is still in use today as part of a home in Perry, Ohio, although only the picture windows are evident from the exterior. In addition, a few window sashes exist from another Kuhlman car which feature the line's signature maple leaf logo etched into the upper panes. The red cars of "The Maple Leaf Route" are now long gone from Geauga County, but evidence of the trails they traversed can still be found in many places if you know where to look. Visit our Then and Now page to learn more. Thanks to Society members Frank Russell, Jim Rivers, Jim Selfe and James Spangler for sharing these photos from their collections, and to member Bill Jackson for his editorial assistance. Text by Society member Brian Gage.